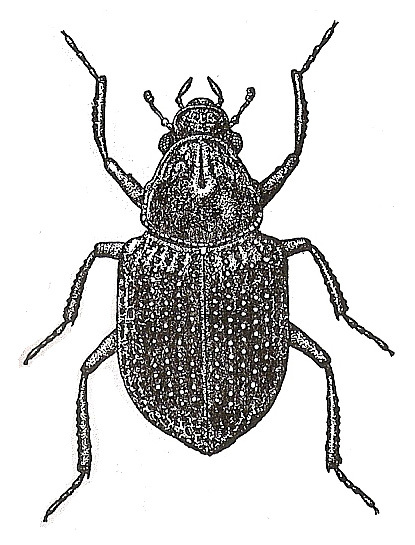 Includes a single British species, Georissus crenulatus (Rossi), a small (1.5-2mm) and rather shiny black species with a weak metallic reflection. The overall form is unique and highly distinctive rendering the species unmistakeable. Immediately recognizable as Hydrophiloidea by the maxillary palpi which are long relative to the antennae. Head vertically inclined so that in normal setting it is not visible from above, densely and strongly granulate apart from a smooth area behind each eye. Eyes convex and protruding. Antennae nine segmented; two basal segments very broad, third quadrate, fourth elongate and thickened towards apex, 5 and 6 transverse and 7-9 forming a club. Insertions not hidden by clypeus. Pronotum weakly transverse (about 6:5), broadest in posterior half and narrowed to round front and hind angles, lateral margin sinuate in front of middle. With a transverse impression at anterior third which separates a smooth and shiny posterior surface from a deeply longitudinally furrowed anterior surface which gives the anterior edge a wrinkled appearance from above. Posterior and posteriolateral margin explanate with a series of large granules, these are absent in front of the middle. Elytra quadrate and convex, each with ten punctured striae, interstices weakly convex, without distinct microsculpture. Apex weakly produced giving the species a distinctive shape. Legs black, relatively long and slender. Front coxae large and projecting, concealing the prosternum. Tarsi 4-4-4, all segments distinct. Within the Hydrophiloidea the combination of three segmented antennal club, expanded front coxae and four segmented tarsi will identify this species. Although we have not yet recorded this species from our Watford area it does have a very wide British distribution with modern records, mostly coastal or near coastal, north to Angus and including the Isle of Wight, Anglesey and Islay (NBN). The natural habitat is in damp silt, clay or clay and sand beside fresh water, either running or standing (Hansen). Larvae live a centimetre or so beneath the surface and feed on mud containing algae and other microorganisms. Adults are active in May and June and may occur in considerable numbers where found. The body is usually covered in a thick layer of mud, they move very slowly and feign death when disturbed rendering them cryptic and difficult to find. Adults have the same feeding habits as the larvae (Hurka).